Last week I came across a couple of lovely examples of the Bullion Knot. Like these perfect Bullion Knots by CoeurdeFreesia. I got so inspired by these beautiful examples in the Flickr Embroidery Group that I decided to try this stitch on a boring old cardigan I had in the back of my wardrobe. Obviously I need to add more Bullion Knot Roses (and practice a bit more, it's far from perfect!) 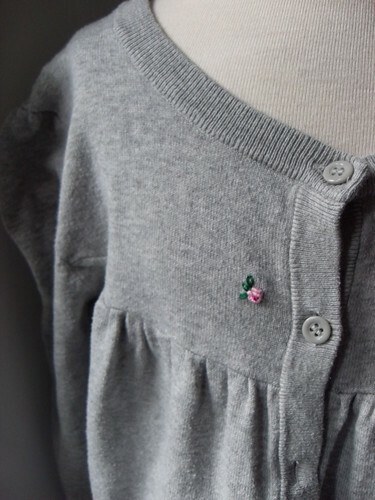 or maybe add some other stitching but I do think it's a rather lovely way to embellish an old cardigan. Check out this video tutorial on Needlenthread.com about the Bullion Knot. It's a pretty easy stitch to learn so give it a try! Wow! That clover is amazing. I've tried to learn this stitch from books (nobody I know knows how to do it) because I've seen *so much* pretty stuff done with it. Thanks for the video link; maybe that will solve my problems. I'm bleeding as I type my thanks for posting comment. I've pricked myself a few times while learning a new stitch..
What a pretty stitch! The tutorial definitely made it seem easy. Thanks for the idea. I hope you'll post another picture once you finish with your cardigan. It's going to look great! Lovely! I'll have to give this one a try. I suspect it might translate as well to coral reef structures as to flowers, and I plan to start on an underwater scene as soon as I finish my current embroidery project. Very pretty. I have been perfecting my french knot this weekend. This could be the next one! 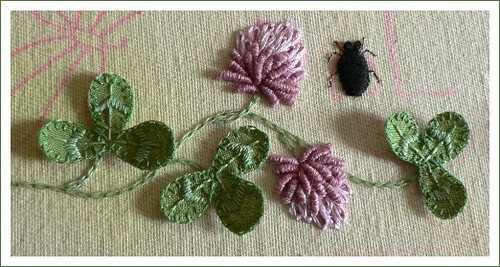 The clover embroidery is so sweet and perfectly executed! I love the leaves in relief, really nicely done. I can do bullion knots, but with difficulty. More practise needed! Your little flower is very cute, and brightens up your cardi! Thanks for including my bullion rose here! I also have a nice video tutorial on my flickr (http://www.flickr.com/photos/bordadosdaana/3283923005/in/set-72157604459743978/). Come and check! Maybe I should do a 'spotlight on a stitch' more often? Glad to read you all enjoyed this post. Love love love the coral idea. Thanks for the additional info too. Ana, your video was great so go check that out as well, everyone! That is beautiful! I am relitiveley new to embroidery and know the stem stitch, backstitch, french knot and flower stitch (kind of, I sort of did it and realized what it was). I'm looking to branch out and learn more - so thanks! I just love embroidery. I really do. I just wish I were a little better at it. Still just love it though. That is very cool. I love how the leaves stand up!!! Thank you for this. I am just about to embroider an area that is calling for flowers and I forgot how beautiful bullion stitches can be. The clover is amazing. I learned that stitch for a Brazilian dimensional embroidery project. I never finished the project. It was very tedious, but beautiful. I need to get back to it, if I can remember how to do it!